the west end. with luna. Might end up at Lemp tonight to catch the always odd Prince Myshkins. And/or at Yemanja Brasil for the Samba Bom benefit for Radio Rio. Want to join me for that (or something else)? I caught a couple shows with these fine musicians in St. Louis in December 2006. It's good to be able to revisit them here. My body wouldn't stop moving. Does anyone out there have an old unused cingular cell phone you don't need anymore? Mine is dying and I don't want to purchase a new one unless I have to. My juggling friend Scott recommended this video. Somewhere in the mix of organizations that includes [but is in no way limited to] the Folk School, Trailnet, Great Rivers Greenway, The Commonspace, the Center for Recording Arts, the Green Center, SCOSAG, the City Museum, the River Des Peres Watershed Coalition, the St. Louis Blues Society, etc. is a vision I rambled to paper at the old Commonspace/People's Coffee a few years back. That is how the magic works. "I certainly don't have to agree with things I'm saying. I just have to say things." 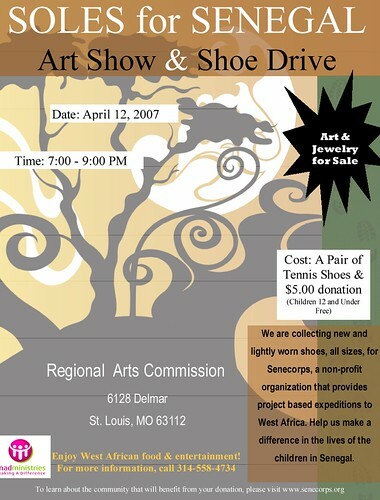 The people with whom I went to Senegal this past summer are raising funds and shoes for people there. Join the festivities at RAC on April 12 from 7-9pm, have a good time, and help in the cause. My personal interest is in getting a nice pair of Keen sandals for Augustin, the head of Africa Matimbo. He asked for my pair while I was in Dakar last summer but I didn't let them go. If you've watched any of the dance video on this site and would like to help me give him a pair, drop me a line, send me some change, and I'll buy him a pair to send back with Akema, Mimi and the folks from Senecorps. The wonderful people at the Folk School of St. Louis will be hosting their regular Student & Staff Showcase on Thursday, March 15 from 7-10 p.m. at Club Room of the Schlafly Tap Room. The event is open to the public and costs a mere $5. The following Thursday, March 22, head out to the 'burbs and catch Justin Townes Earle at the Ranch House Concerts series. went to Saam Ndiaye and were there met with a festive gathering. Tennessee Williams' first full-length play, Candles to the Sun, will be presented in a staged reading by actors from the University of Illinois at Urbana-Champaign (UIUC) on Friday, March 16, at 8 p.m. 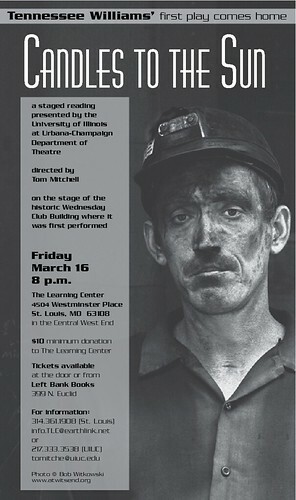 The reading will take place at The Learning Center, 4504 Westminster Place, in St. Louis' Central West End. The building occupied by The Learning Center originally housed the Wednesday Club, where the play was first produced seventy years ago. Admission at the door is a $10 minimum donation to benefit The Learning Center. For information, contact Emily Richard at The Learning Center 314.361.1908 or Tom Mitchell at the University of Illinois at Urbana-Champaign 217.333.3538. Tickets can be purchased at Left Bank Books or ordered by calling The Learning Center. Speaking of what's in circulation, my high school friend Paul Benjamin has just released Pantheon High, a manga graphic novel that "imagines all of the characters of the various world mythologies living together in one universe—and sending their children to the same high school in Los Angeles" (and here I thought it all happened in OKC). I tried to grab a copy at my local comic shop, but they didn't have one so I ordered it on-line and passed it off to a manga fan student of mine. I'll post kid reviews here as they come in.